Aspire reaches new heights, setting new world records for an exceptional painting by Alexis Preller and a drawing by contemporary artist, William Kentridge. New records were set for works by Mohau Modisakeng, Pieter Hugo and Georgina Gratrix in a major coup in the contemporary segment. Aspire Art Auctions’ latest Johannesburg sale was held on 28 October 2018. Despite the stringent macroeconomic conditions in South Africa, Aspire rose above the constraints, delivering an impressive set of results and several triumphant world records. Led by two exceptional but radically different lots – an electrifying late period Alexis Preller oil painting, Adam (1972), and a drawing from one of William Kentridge’s early Soho Eckstein films, Drawing from Stereoscope (Double page, Soho in two rooms) (1999) – the sale was held in the dynamic surrounds of the Illovo campus of the Gordon Institute of Business Science, Aspire’s ongoing venue hosts in Johannesburg. R9 104 000, a world record for the artist, beating the previous mark of R8 433 924. The work has never before been to auction, and was chosen by Preller himself as one of only five works to showcase the artist at the 1973 São Paulo Biennale. The stunning performance of this work on the sale was echoed by the performance of the magisterial Kentridge drawing. Aspire established the South African record for a Kentridge drawing last year, with its sale of another work from one of the artist’s animated films, Drawing from Mine (Soho with coffee plunger and cup) (1991). 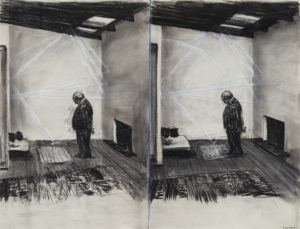 The company has now achieved a stellar world record price at auction for a Kentridge drawing, at R6 600 400 for the Drawing from Stereoscope, significantly beating the previous mark, achieved in Paris, of R5 744 788. Fierce bidding in the room and on the telephones ensured that Aspire reaped the benefits of a focused international and South African marketing campaign promoting both works. Says Aspire Director and Senior Art Specialist Emma Bedford, “We’re delighted to have achieved such profound breakthroughs in the market at a time when the economy is tough for everyone. Our successes with these two remarkable works speak to the faith that our clients have in us, and are testament to our growing international reputation and gravitas”. In addition to these spectacular performances, the company also saw major successes in the modern and contemporary segments, and some notable sales in their top quality sculpture offering. This segment of the auction also featured black 20thcentury artists whose market is being developed by Aspire. The company holds the current world record for Amadlozi alumnus Sydney Kumalo. His Reclining figure sold at R682 800, in line with its estimate. 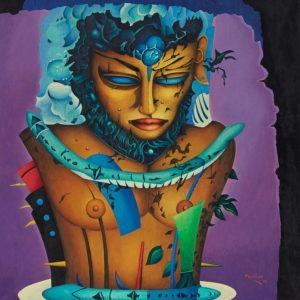 Kumalo’s contemporary, Ezrom Legae, sold well with the iconic work Head,achieving R396 300. A spectacular selection of work by celebrated Johannesburg sculptor Edoardo Villa performed equally well. The artist fetched a world record with Aspire in 2017, when Vertical Composition (1958)achieved R1 818 880. Villa’s work has at last been acknowedged with an appropriate retrospective exhibition context, with the newly-opened Norval Foundation’s recently staged major show. The top Villa lot, Liberation, a complex and compelling work from 1986, sold for R682 800, matching the result for his Four Faces. All three of these sculptors were associated with the 1960s Amadlozi Group based around collector Egon Guenther and the Polly Street Art Centre under Cecil Skotnes, a slice of South African art history that is becoming more and more significant among collectors. Aspire Director and Senior Art Specialist Mary-Jane Darroll comments, “Aspire’s position in the market has always had a strategic focus on developing the market for previously undervalued and under-represented black artists. It’s very gratifying to see this happening more often on our auctions, particularly with this group of artists”. Aspire has since its inception also been a leader in the industry for contemporary fine art. The segment is a specific strategic focus for Aspire, and is currently growing globally at a rate of 19% year on year. The South African contemporary market as a whole sits at a very respectable 13th in the listing of the top 20 countries by turnover value in the segment, ahead of countries like India, Switzerland and Denmark. The market here grew by 25% in the last year, much of it driven by Aspire’s sales. 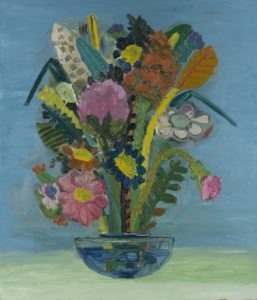 Contemporary highlights on this sale included a new world record for Cape Town painter Georgina Gratrix, whose work I Love You All the Timesold for R591 760, beating the R318 304 previously achieved for the artist by almost double, and further almost doubling its high estimate. These successes in different areas of the market – specifically in the modern and contemporary segments – provide definitive evidence that Aspire is the chosen destination for local and international sellers and buyers at auction. Ruarc Peffers, MD, Senior Art Specialist and auctioneer, comments: “We are delighted to be seeing these kinds of results not only in the contemporary segment, but across the board. For us at Aspire it’s always gratifying to see contemporary work perform well, however, because it usually means that our Artist’s Resale Rights (ARR) project is deployed. The project sees all these living South African artists gain royalty payments from the successful sale of their work on our auctions. We’re very proud of the fact that ARR has just been awarded the Best Strategic Project Award by Business Arts South Africa”. Peffers concludes: “This auction is a benchmark for us at Aspire. We’re systematically gaining momentum, presence and gravitas, and, as our world records show, we’ve developed a brand presence, both locally and internationally, that speaks volumes of where we are as a company”. Aspire’s next sale is on 3 March 2019, at The Avenue in Cape Town.